Muslim belief has it that the conversations, pronouncements and actions of the Prophet Mohammed and a few of those close to him are recorded in the collections of biographical information that were assembled two hundred years after his death. The more realistic of today’s Western scholars take the view that the authenticity of the collections is highly doubtful: each scrap of information or hadith (plural: ahadith) was gathered from a chain of transmission stretching back two centuries and with no independent historical verification. In spite of that, the collections of ahadith carry great authority for Muslims, second only to the Qur’an itself. 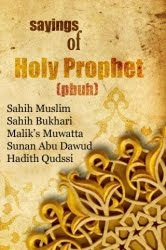 Some ahadith form the basis of Islamic law and some recount the more notorious aspects of Mohammed’s life, such as nine-year-old Aisha telling how her mother washed her face and then handed her over to the Prophet for his gratification. For now, though, a few examples to warn against elevating the witterings of a madman to the status of sacred text. Islam regards the Prophet Mohammed as the perfect man, which just about says it all.